John Robertson, the Inverness Caley Thistle manager, declared this deserved victory and near-spotless October form “only the start” for his resurgent team. Connor Bell’s fourth goal of the campaign was enough to sink the Pars and ensure the hosts have now navigated the whole of the month unbeaten and without a goal conceded in five matches. Robertson’s rebuilt squad, with 13 summer signings, now looks capable of mounting a promotion charge. 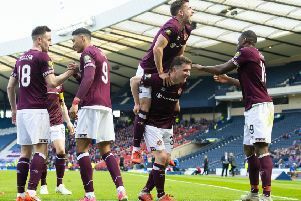 “We really needed that here at home because the fans have been starved of a good win against a good team here – and we got it,” the Hearts legend said. It was one-way traffic in the first half before the 23rd minute opener. Irishman Jake Mulraney’s low-swept cross eluded Pars captain Callum Morris and fellow defender Lee Ashcroft as Bell slid in at the far post to score. The Pars’ one big chance of the first half came after 36 minutes only for young Callum Smith to miss when clean through on goal.